Today's Draw: Three of Pentacles from the Art of Life Tarot. Do you create for yourself or others? Can you put your work out in the public and feel good about it, even if people don't like it? What do you really create for? 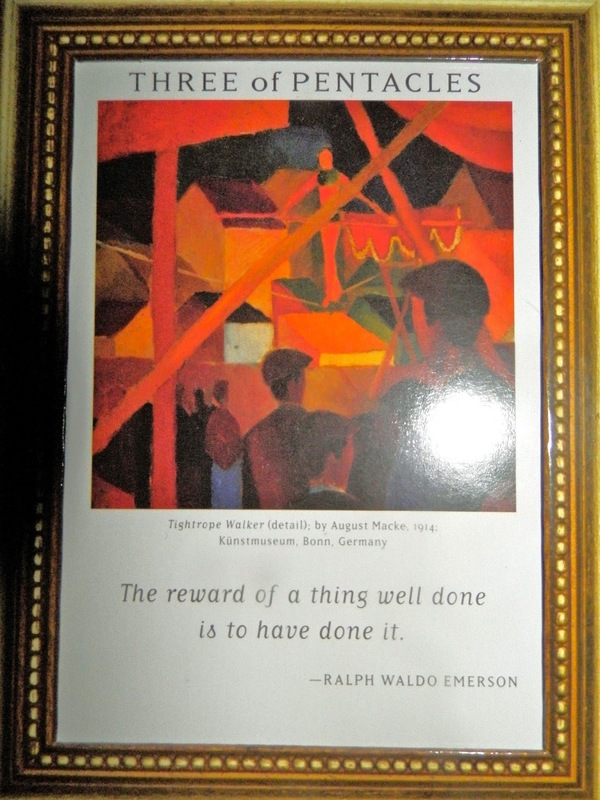 The Ralph Waldo Emerson quote on this card reads, "the reward of a thing well done is to have done it." It's not about the notoriety, compensation or recognition. It's about doing something well. And I would also add, the process of doing it is its own reward. As a writer, the work I do is very subjective. You might like it. You might not. And doing it professionally means you hold it up to people with their own styles of writing, ways of wording things and sensitivities. Which means nothing you ever write will end up the way you originally wrote it. I'm saying all of this because you can either invest emotionally in what you do and let the fate of your "success" rest in the hands of someone else. Or you can quietly know when you've done your best work, regardless of how others feel. There is an artist I'm familiar with (and I'm not going to say whether that artist one from my career, from the tarot world or just an artist I know, so don't go thinking it's YOU) that is incredibly talented. He/she is highly admired. But there are many who appreciate his/her talent, but don't like his/her style. So inevitably, there are those who fall to kiss his/her feet and those who say "he/she ain't all that." Well, as you might imagine, this artist responds really well to those who worship them. But they become a whiny little primadonna at the first mention of anything that's less than supportive of their work. They throw a fit. They threaten to abandon projects. Their whole sense of value is wrapped up in being all things to all people. And that just never happens...for any of us. The crappy taste disapproval makes in this person's mouth has made them choose "peace" over art. All because they hang their success and worth on how well their work is received by others. Now, this person has survived a long time as an artist with that attitude. But frankly I don't know how. I know that with the work I do, I wouldn't have survived under those conditions. I couldn't keep the passion burning at least. Sure, we all want to be well received, but reality is that not everyone is going to like your "way". But there's plenty of work available among those who do. So find your audience, then once you do, learn to make the process and the honest effort you put forth your reward. In that context, people loving you will be gravy. And people not loving you won't rob you of your own self value. From time to time I think creative people all slip into doubt. But if I had one piece of advice to deliver to someone who wants to thrive and find balance in a subjective, creative career, it would be to be self aware enough to know when you've put forth your best and make that your goal. There will always be an audience for you, but don't start counting heads and measuring your audience against the audience of others. Ultimately, the value in creativity comes in the doing, not in the applause.